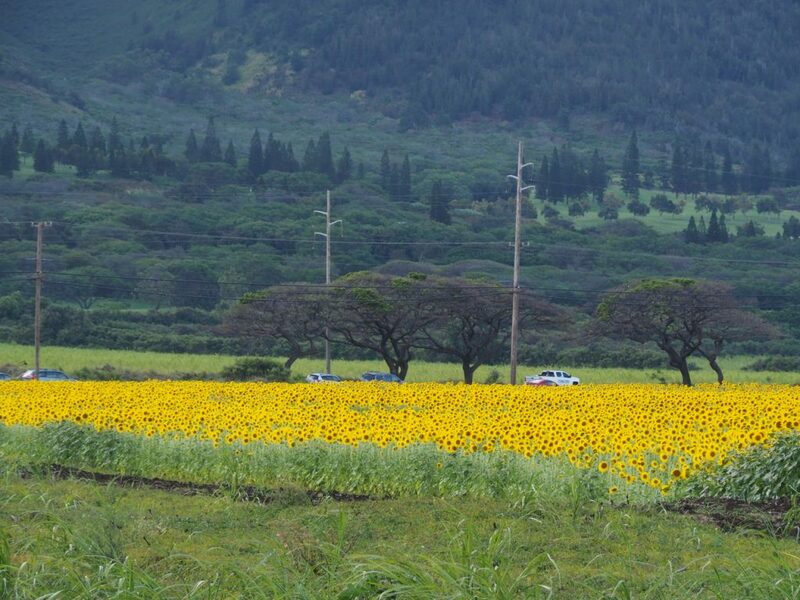 A field of brightly colored sunflowers has drawn the attention of many a passing motorist in Central Maui as the field reaches its full bloom just in time for Earth Day. 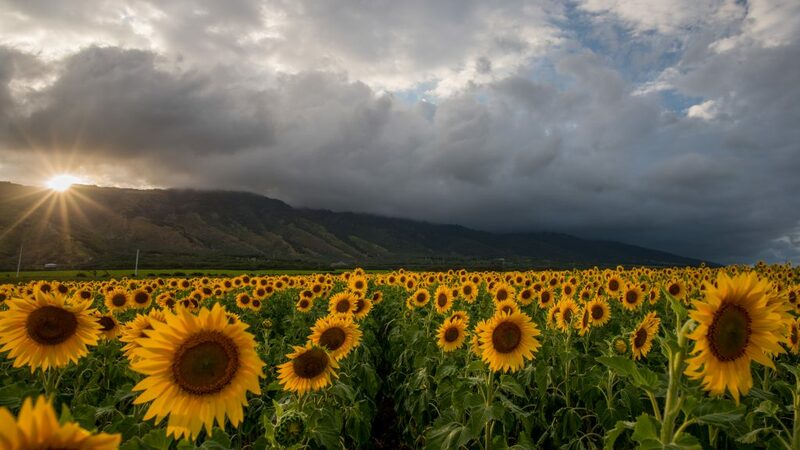 The sunflowers were planted by Pacific Biodiesel in February as the company’s first biofuel crop on Maui, at the largest biofuel crop project site in the state. They are now 65 days old and will be in bloom for approximately 20 to 25 more days before they start to wilt and dry out. Harvest will be done around day 110 and the company plans to plant the next plot within one month after harvest. Standing at attention: A blanket of yellow sunflowers all bend in the direction of the sun. 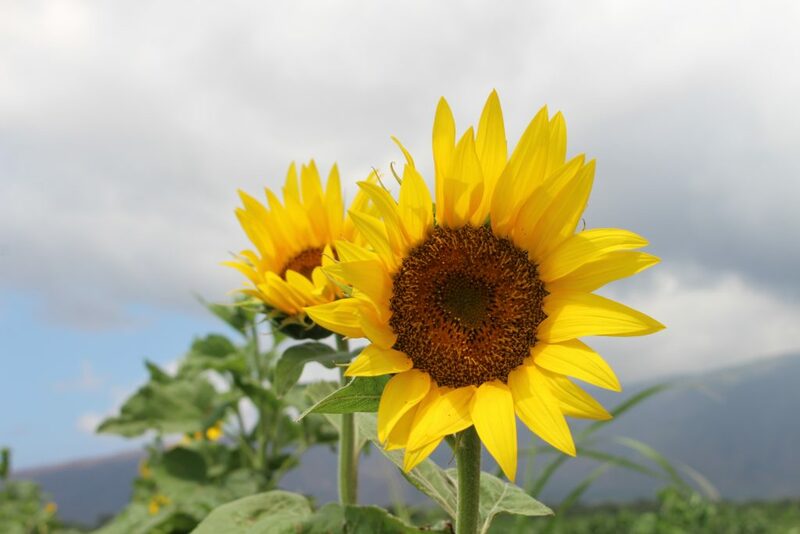 PC: Maui Sunflower by Wendy Osher. 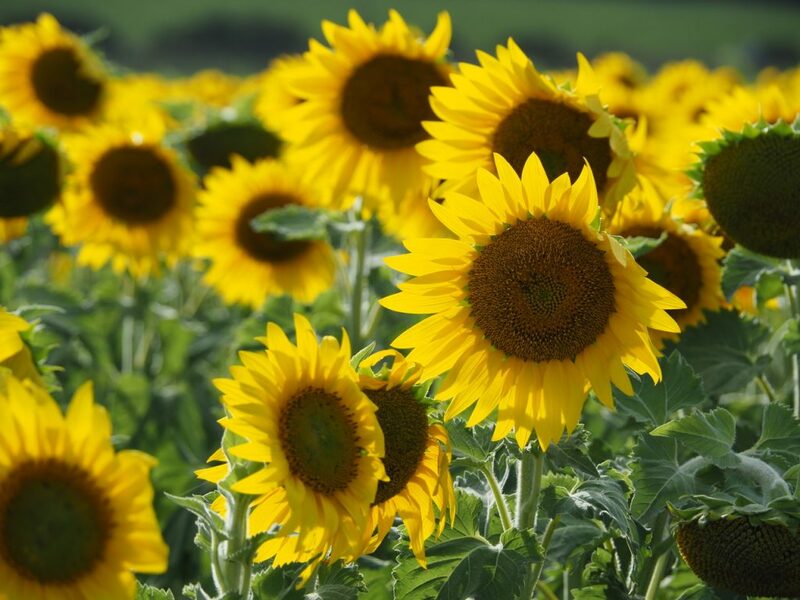 The current sunflower crop is approximately 12 acres of a 115-acre biofuel crop site. Pacific Biodiesel is working to expand diversified agriculture by growing combine-harvested oil crops on land previously used for sugar cane production. 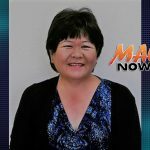 Company representatives say this is the largest biofuel crop project in the state of Hawaiʻi and the only biofuel farming operation in the state running on 100% renewable fuel, showcasing the company’s sustainable, community-based model of agriculture and renewable energy. 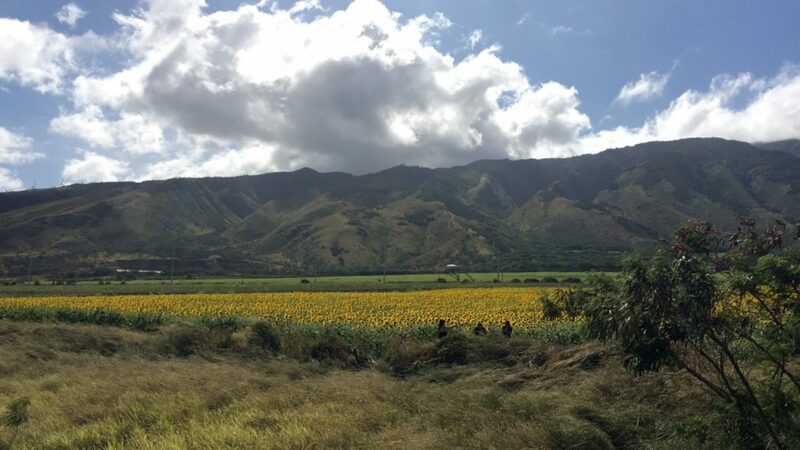 The blanket of yellow sunflowers all bend in the direction of the sun, standing at attention on land between the Kūihelani Highway and the Honoapiʻilani Highway in Central Maui. 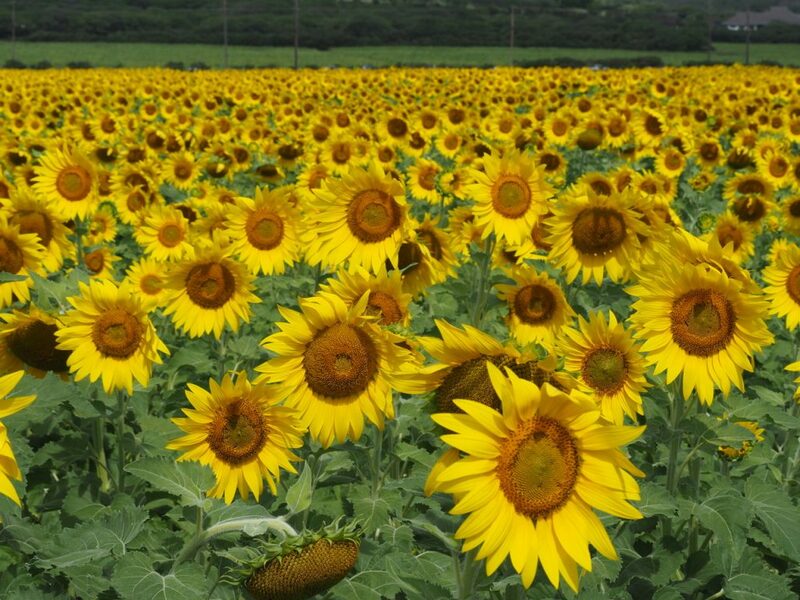 Pacific Biodiesel sunflower crop. PC: 4.11.17 Maui Now image. UPDATE: As of 7:45 p.m. on 4.11.17, all Earth Day Tours were sold out. We’ll keep you posted if there are any changes. 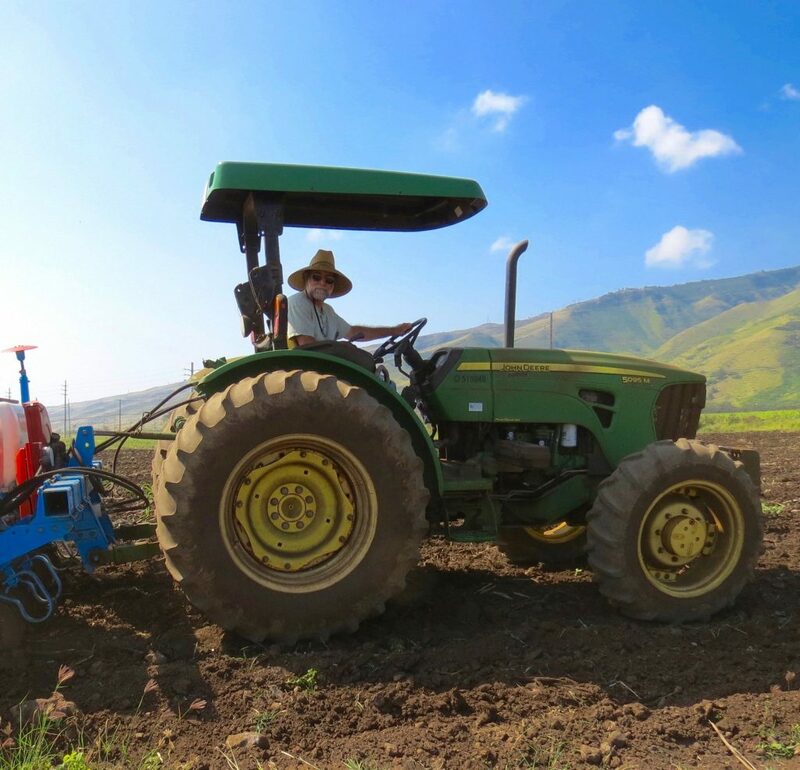 In addition to the upcoming Earth Day event, in the future Pacific Biodiesel will be working to organize tours of the farm to give people access to learn more about these biofuel crops and the company’s sustainable ‘agriculture and renewable energy’ model. Pacific Biodiesel invites the public to share in the first sunflower blooms at an upcoming Earth Day event on Sat, April 22, 2017, from 10 a.m. to 1 p.m. The event marks the company’s one-year anniversary of becoming the world’s first biodiesel producer to be certified by the Sustainable Biodiesel Alliance. The event is free and open to the public, however, reservations must be made in advance and space is limited. (See update above). There is also NO public parking at the event site. Registered guests should park and check in at the Maui Tropical Plantation and will be able to catch a Pacific Biodiesel’s shuttle fueled by locally made biodiesel. Shuttles will take guests on a round trip to the sunflower field. 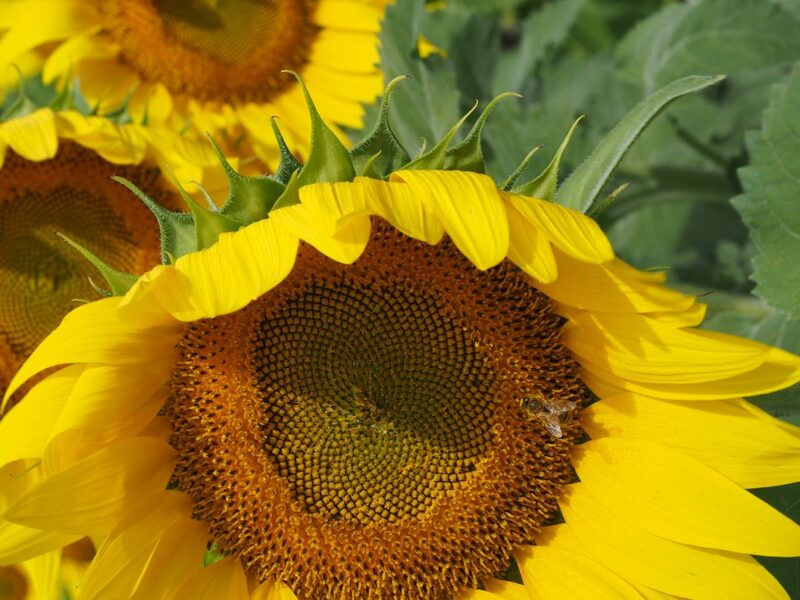 Visitors will receive a sunflower bloom freshly cut from the field, will be able to plant a seed for the next crop and are invited to enter an Earth Day 2017 sunflower photo contest. A limited quantity of “Eco Champion” passes will be available (at the shuttle check in area) for $20 that include priority boarding on complimentary biodiesel shuttles, a commemorative Pacific Biodiesel water bottle, a gift card to Maui Tropical Plantation, Maiden Hawaiʻi Naturals macadamia nut beauty oil, and a packet of organic sunflower seeds. Net proceeds will benefit the Sustainable Biodiesel Alliance to support local, sustainable biodiesel production in communities across the nation. 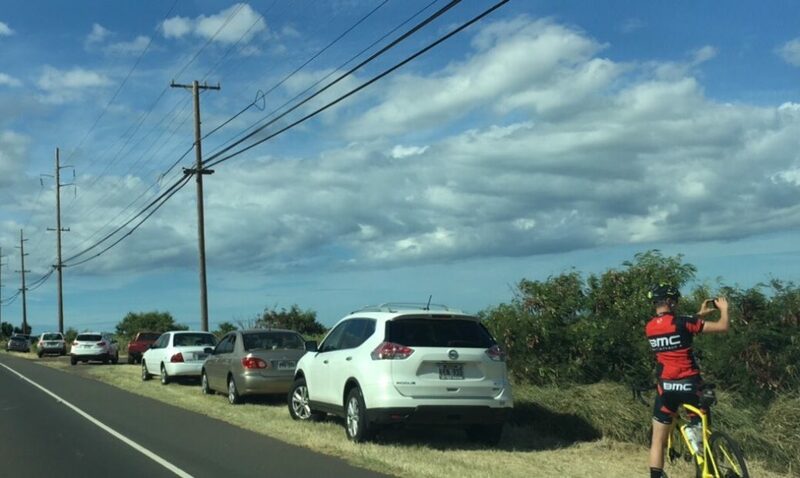 Cars line the Kuihelani Hwy where motorists have pulled over to enjoy the view. “We are not allowing people to drive onto the farm site. In addition to our upcoming Earth Day event, in the future we will be working to organize tours of the farm to give people access to learn more about these biofuel crops and our company’s sustainable ‘agriculture and renewable energy’ model,” said a company spokesperson. PC: Maui Now 4.11.17. 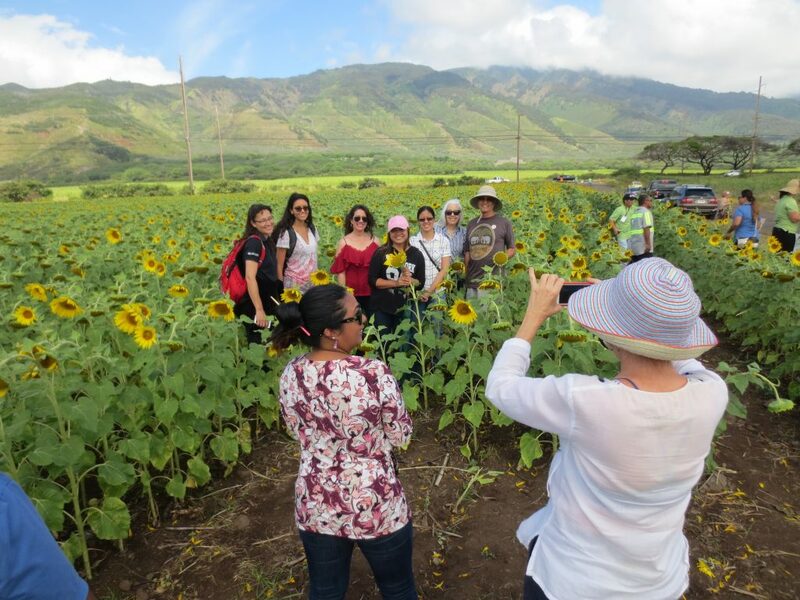 Company spokesperson Joy Galatro said, “We’re happy to see people so excited about the sunflowers. 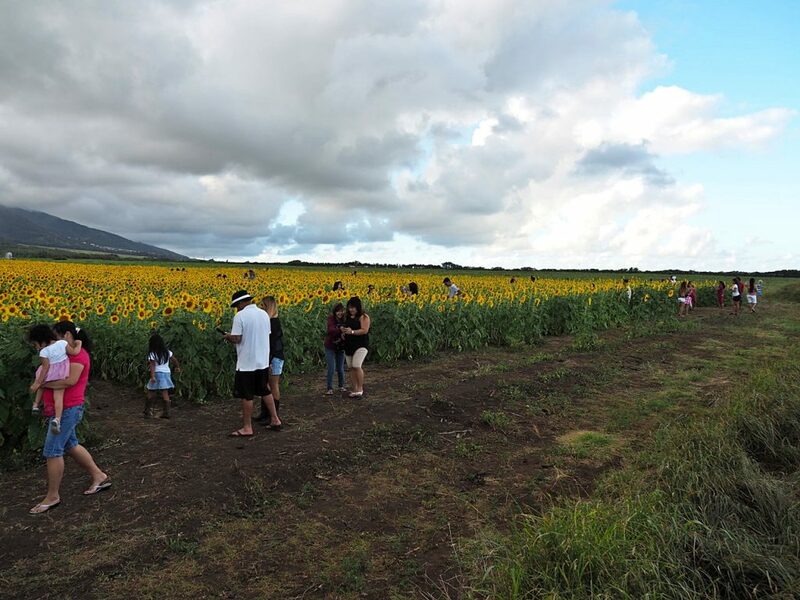 Everyone has been very respectful while taking their photographs,” but did note that the sunflowers are located on private property on a working farm site. “We are not allowing people to drive onto the farm site. In addition to our upcoming Earth Day event, in the future we will be working to organize tours of the farm to give people access to learn more about these biofuel crops and our company’s sustainable ‘agriculture and renewable energy’ model,” said Galatro. “We’re designing a sustainable, zero-waste and economically viable system to grow food, animal feed and fuel. Short-term crops that harvest in 100 days or less can be planted, harvested, crushed, and converted to biodiesel, all in Hawaiʻi,” said Pacific Biodiesel President Bob King when the crop was planted earlier this year. Pacific Biodiesel is focusing on several different crops in various rotations, and experimenting with different soil amendments such as compost and others made from by-products of the production of biodiesel, like glycerin and potassium sulfate. 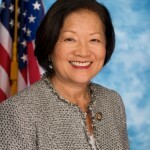 Kelly King, Vice President and Co-Founder of Pacific Biodiesel and South Maui County Councilmember said in an earlier announcement that the “eye-catching symbol of sustainability,” will help as the state reduces reliance on fossil fuel, and works to achieve its 100% renewable energy mandate by 2045. When the crop was planted, the company had projected an initial yield of 100+ gallons of oil per acre per harvest, with up to three harvests per year possible.